Istanbul Fashion Week, abuzz with Turkey’s forefront designers and fashion icons, opened Monday with a salute to the country’s rich past. Menswear designer Hatice Gokce kicked off the week with her runway collection inspired by the great Ottoman adventurer Evliya Celebi. Known for colorful narratives documenting his journeys through the Ottoman Empire and abroad, Celebi’s legacy made it to the catwalk Monday -- more than 400 years later. With hues of silver, brown, and black, coupled with metallic and leather pieces -- hints of craftsmanship from the Ottoman era -- every outfit had a distinct Ottoman flair. 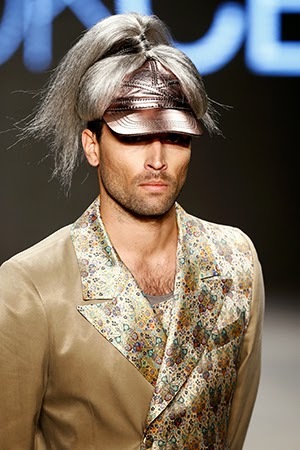 Many of the models had full beards and wore harem pants.